As executor of an estate you will have to make a lot of decisions. The timeframe for those decisions depends entirely on you. You may want to put the home that is part of the estate up for sale. However, it doesn’t have to be right away. Then again, if the property taxes on that home are exorbitant, then you may want to sell it quick so that you won’t be stuck with that burden. To get a home ready for sale it will mean clearing out everything that’s inside. Some of that can go quickly with an estate sale. Instead of a yard sale where everything is brought to the on, an estate sale literally opens the door of the home and puts the price tag on everything inside that house. One good weekend can have a lot of the possessions gone. What’s left behind becomes part of the necessary estate cleanup. For that task you can bring in Junk King Chico. Junk King will provide you with your own moving crew at least for the duration of the estate cleanup. This might be a standard two-man operation or it could involve several additional Junk King team members. It all depends upon the size of the clearing. On want to stay clean up it took six movers and three trucks to get the job done. It is probably a good idea if you have a lot of items to get rid of to bring out Junk King in advance of the appointment so that they can size everything up. The Junk King moving crew is going to do all the work for you. You don’t have to bring it all down to the living room to make it easy for them. They actually want to make it easy for you. That could involve going into every room and pulling out items. This is what the Junk King moving crew does every single day. Junk King offers great pricing for this type of work. If you were to hire your own movers, then you would be paying by the hour and that could be a very expensive proposition for this type of work. Junk King’s flat fee covers all the labor whether they are clearing out the house for one hour or six. The price is really about how the truck gets filled up. Fortunately, the Junk King movers know how to pack up a truck tight and that will translate into the low end of the price range for you. Junk King Chico wants to make your estate cleanup go as smoothly as possible. Book that session today. This entry was posted in Chico Junk Removal and tagged estate cleanup, Junk King, junk removal on March 31, 2019 by Junk King. Last updated March 31, 2019 . Part of doing business in an office is setting up a way to keep that office clean. Usually, that will mean janitorial services coming in at night once the workers are gone home. These workers aren’t meant to do a deep cleaning the but instead take care of all the obvious things like empty and the wastebaskets, vacuuming and cleaning up the break room. It’s always nice when the staff can come back into a space that is clear of trash. What happens when there’s more than just crumpled up paper to get rid of? If there’s a big cleaning that involves rubbish removal, then Junk King Chico is the company you want to hire. Every office has random pieces of furniture and equipment that has been upgraded. Those extra items and up going into a cubicle that’s not be used or a storeroom. They might also end up in the parking garage because there’s no available space in the office. The moment something goes into storage that is not going to be used again is wasted space. That is space that you are paying for and needs to be maintained. One call to Junk King can get that space cleared. It doesn’t matter the size or weight of what you’re throwing out. All that matters to Junk King is that you want it gone. Junk King will dispatch a team of friendly movers to get rid of all that unwanted office rubbish. These movers have a positive attitude and a great with solving problems like how to maneuver something into a freight elevator. There also licensed and insured which makes them the exact kind of professional vendors that you should be hiring for your business. Junk King likes to move fast. When the unwanted items have reached critical mass in your office, you definitely want to remove them quickly before the next client shows up for meeting. Most Junk King sessions are completed within 24 hours. Junk King also has appointments available on the weekend if you prefer to not disrupt the office staff at all. Getting rid of your excess office rubbish can be a quick and efficient job when you turn that over to Junk King Chico. This entry was posted in Chico Junk Removal and tagged Junk King, junk removal, office on March 24, 2019 by Junk King. Last updated March 24, 2019 . Right now, there are parts of the country that are still dealing with “winter wonderlands” of snow and ice. That will probably never be an issue in Chico but we still are eagerly awaiting the first day of spring if are no other reason than to just say, “hey, it’s spring!” If spring cleaning is on the agenda, then you might want to get that task started with some intense rubbish removal. When that it is the goal, then Junk King Chico is the only call to make. What kind of rubbish can Junk King take away? Anything that isn’t deemed a hazardous material can be hauled away by the junk King crew. That means all your old furniture, mattresses and big kitchen appliances that you replaced can all be loaded onto the truck. If you had a renovation project going on the last couple weeks, then no doubt there is plenty of construction waste that needs to be cleaned up. Junk King can haul that away also. And it is not just the big things that junk can take away. You can box and bag up all the unwanted items from your closet and garage like clothing that will be one again or electronics that will be used. That can open up a lot of space throughout the house and it can all happen in a single session with Junk King. How quickly Junk King will move depends on just how much of getting rid. They’ll ask you to set aside a two-hour window for the session. But that two hours has more to do with getting from one home to the other than the actual work. Most sessions are completed in just under 30 minutes. Of course, if you have a more intense cleanup that need to be taken care of, then Junk King won’t hesitate to facilitate that job. In fact, they might even summon up additional crews and trucks to make sure everything is cleared away in a single day. 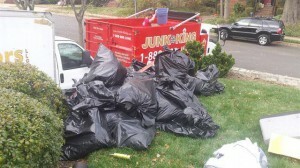 On one recent job, six Junk King team members and three trucks were required to clear out an entire home. It was a big job but not a problem for Junk King. Taking care of a room to room rubbish removal with the help of Junk King Chico is the perfect way to start spring cleaning this year. Book that session today. This entry was posted in Chico Junk Removal and tagged Junk King, junk removal, rubbish removal on February 28, 2019 by Junk King. Last updated February 28, 2019 . Finding the right worker to perform a service in your home takes a little bit of research. That research can begin with asking your friends who have used a similar service or by conducting an online search for the type of business that would provide that kind of service in your community. Once you have found the right service professional, they will be someone you can use again and again. For the task of junk hauling, the right professional would be Junk King Chico. They have been in this line of work since 2005 which only proves they know how to get this kind of job done right. The approach the Junk King takes to every appointment is to make sure the customer is totally satisfied and doesn’t have to do a bit of work. The idea of hauling a heavy piece of furniture or bulky appliance might seem complicated if you were to do that on your own. Junk King is going to be sending over a team of movers who will be doing that lifting and loading for you. That means there isn’t any limitation on what you can turn over to them that you’d like to get rid of. Whether it’s something extremely heavy or an oversized item in an upstairs bedroom, the team from Junk King will make it look easy to get rid of. Before they begin loading things onto the truck, the Junk King crew will present you with an estimate. This estimate is going to be based on how they will pack everything up on the truck. Think of it as a big game of Tetris. The Junk King crew knows how to fit a sofa and a box of clothing so that it takes up a minimum amount of space. The less room your junk will fill in the truck, the less you’ll be paying. You will know what this price is before the work begins and it won’t be something that will change with surprise add on charges. Finding the right junk hauler in Chico is easy: just put Junk King Chico on the job and watch how fast your junk and disappear. This entry was posted in Chico Junk Hauling, Chico Junk Removal and tagged junk hauler, Junk King, junk removal on February 23, 2019 by Junk King. Last updated February 23, 2019 . A property manager is a perfect example of a service professional that needs outside help. The role of a property manager is to make sure everything at a property is be taken care of from collecting the rent to the maintenance. That puts the property manager in a position to delegate tasks to various service professionals. When there is a problem with the plumbing, a property manager is not going to go out to the property to fix a pipe. The same can be said for cleaning up that property when a renter has moved out and left behind rubbish. As a property manager, you can’t spend time loading up the truck of all that unwanted stuff and then driving around looking for a place to dispose of it. Instead, you can turn that task over to Junk King Chico. These are the expert junk haulers who been in this line of work for over 14 years. When a tenant leaves without a walk-through it is a pretty clear indication that they’ve left stuff behind. Whether that stuff is inside the rental property or on the curb really doesn’t matter. It becomes the responsibility of property manager. You could take a few minutes to sort through those discarded items to make sure there isn’t anything of genuine value. Sometimes, a careless renter might mix in property that belongs to the owner. Once you establish what can get tossed out, then it’s time to set up your appointment with Junk King. Your Junk King session will be taken care of by a pair of movers. This is the team that is going to do all the lifting and loading action. The amount of what you’re throwing out doesn’t matter to the Junk King team. They’re going to be rolling up in a truck big enough to hold close to an entire home’s worth furnishing. It sure to fit whatever you need to get rid of. You also don’t have to concern yourself with how heavy all this stuff will be. That’s because Junk King never charges by the pound. Property managers all across Gold Country have discovered the valuable help provided by Junk King Chico. Do you need to put them to work today? They are standing by to help! This entry was posted in Chico Junk Removal and tagged Junk King, junk removal, property managers, rubbish on January 30, 2019 by Junk King. Last updated January 30, 2019 . When you say the word “estate” most people conjure up an image of a large mansion with rolling lawns of green grass. The reality is that anyone who owns a home actually owns an estate. An estate is another way of describing property and possessions. At some point, you may be put in charge of an estate. That usually happens when an adult child has to support their parents making the transition into a more manageable living environment or assisted care. You certainly don’t want to have a big house sitting vacant loaded up with all kinds of property. Instead, there needs to be in the state cleanup. A company like Junk King Chico would be the perfect partner to help with your estate cleanup. Decisions have to be made with any estate cleanup. You need to decide which items you want to keep and which ones you want to sell. Everything else would be the things that are turned over to Junk King. That might actually end up being quite a lot of old furniture, carpeting, drapes, bedding, appliances and other household goods. Even though some of those items could still be useful that doesn’t mean you have to hold onto them. When Junk King is working on the cleanup assignment a lot of what they collect will be donated to charities. Many of these organizations except things in all kinds of conditions. That’s because they also employ folks to handle repairs and refurbishing. Junk King has developed working partnerships with these organizations and knows exactly what they are looking for any given time. Working with Junk King means that your estate cleanup can also be taken care of swiftly. This is important especially if you plan on putting the home on the market. Junk King knows what it takes to get rid of a lot of stuff from a home. That might require additional crew members and trucks to handle everything in a single session. If that happens, then you won’t be paying extra for the crews. You’ll only be paying an amount based on how the trucks will get packed. It’s all about the volume and not about the weight. Let Junk King Chico help take away the unwanted items from your estate cleanup. It will be one less thing to worry about. This entry was posted in Chico Junk Removal and tagged estate cleanup, Junk King, junk removal on January 23, 2019 by Junk King. Last updated January 23, 2019 . Before Christmas, there is a lot of “hiding” that goes on in a home. Presents are wrapped and placed in spots where prying eyes can’t find them. Even if they are discovered, there is just so much that can be done by shaking a box to determine what is inside. 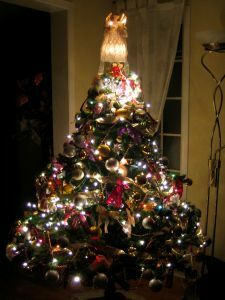 After Christmas, everything is literally out in the open and that’s a good time to take stock of just what is working and what can go. Your post-Christmas cleanup should have the goal of no rubbish anywhere in the home and the best way to accomplish that goal is to bring in some help from Junk King Chico. After Christmas day, you probably packed your garbage cans with all kinds of boxes and wrapping paper. But what about the things that can be broken up or crumbled into a small pile? An old recliner can be considered rubbish if no one is going to sit in it again. A giant tube TV set that has been replaced with a HDTV flatscreen is totally rubbish. The same can be said for a lot of articles of clothing. To make room in the closet, you need to get rid of all those things you know you’re never going to wear again. All of those items can be gathered up by the crew from Junk King and swiftly loaded onto their truck. You might not give a second thought to the garbage and rubbish you’re getting rid of but Junk King is going to take the time to make sure it is all disposed of in a responsible manner. That usually involves making a drop off at a charity or recycling center. The last option would be taking the items to a landfill. That is what Junk King wants to avoid and, so far, they’ve managed a very respectable diversion rate. Remember, when you hire Junk King, you’re really hiring two movers who are going to do all the lifting and loading work. There won’t be any limits with regard to size or weight. Just ask the Junk King crew about the last time they removed a hot tub from a home! A post-Christmas cleanup with Junk King Chico can leave a home without a speck of junk or rubbish. That’s a great way to start a New Year. This entry was posted in Chico Junk Removal and tagged Junk King, junk removal, post Christmas cleanup on December 30, 2018 by Junk King. Last updated December 30, 2018 . Junk King is part of the community and knows how important it is to provide a rapid response for a cleanup after a natural disaster. With municipal resources stretched thin, it is good to know you can always count on Junk King. Junk King is going to send over two capable movers for your session and that makes you the boss of that session. You show the team what you want removed and they’ll handle the rest. It is that simple. Based on the reviews, it seems clear that a one-time Junk King Chico customer is a lifetime Junk King customer. Are you ready to join the club? This entry was posted in Chico Junk Removal and tagged customers, junk, Junk King, junk removal on December 23, 2018 by Junk King. Last updated December 23, 2018 . By now, you’ve probably seen photos and the new stories about the wildfires that savaged a good portion of the state. Thankfully, the California Department of Forestry and Fire Protection has been able to proclaim that the devastating Camp Fire has been contained to within 153,336 acres. This fire got its start in this the Sierra Nevada foothills on November 8. It spread quickly destroying over 18,793 structures. Within that number are 13,972 homes that were burnt to the ground. The entire retirement town of Paradise, with a population of 27,000, was totally leveled. All of these numbers add up making this the most destructive fire in California history. With the fires contained, the effort now turns to helping those victims that have been displaced to rebuild their lives. Consider that most of these victims only had moments before evacuating. Their only remaining possessions a whatever they were able to pack into their car. This is literally about these families starting over.